Old Bokeelia where you can fish right off your dock, + watch the manatee and dolphin play. 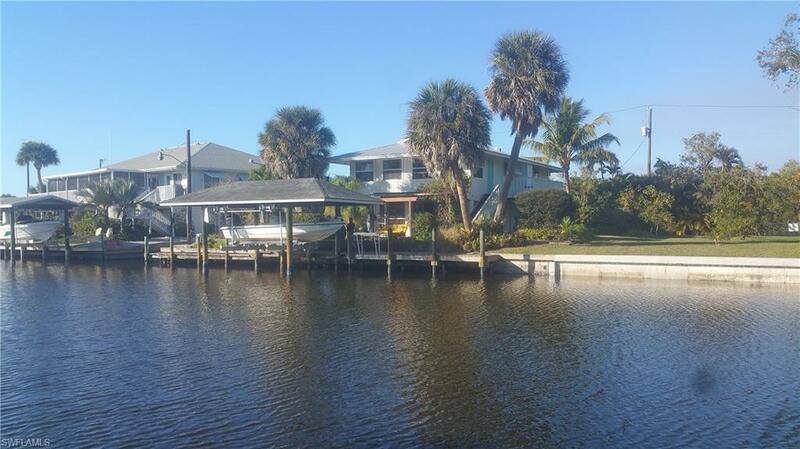 Enjoy quick access to the surrounding waterways. An abundant mature landscape includes honey-bells, orchids, bromeliads, pony tail palms+more. Back in history this home and many of the surrounding lots was owned by a Bokeelia family and used as an up-down duplex. The downstairs has two sleeping rooms a large storage closet and a big living area and screen enclosed lanai that opens directly to the garden level. The upper main home has 2 bedrooms and 2 baths, a wonderful living dining area with windows all around to take in the spectacular views while enjoying the breeze that always occurs on the point.This home is situated on one of the most lovely and sought after parts of the island.The lot adjacent is also for sale and can be purchased together or separate from this home.The adjacent lot-10 being sold separately. lot 9 + 10 are 150' on water. Extra living area lower level 2 bdr 1 bath approx 803 sqft as per county.